“Western Shoshone ranchers Mary and Carrie Dann fought the federal government for decades to preserve their ancestral lands and the right to graze livestock without permits from the Bureau of Land Management. The newly available records of the Western Shoshone Defense Project explore the Dann Sisters’ struggle, and that of the Western Shoshone, over issues of sovereign rights contested for years in the federal and international court system," states the University of Nevada Reno Special Collections. Dann, accompanied by the Gages and family and friends, will be at the Reception from 1:30 to 3:00 pm in Reno on Saturday, September 26 and will be making remarks at 2 pm. The reception will be in the Randall Rotunda on the second floor of the Mathewson-IGT Knowledge Center. Complimentary parking is available in the Brian Whalen Parking Garage. Although the Western Shoshone had filed suit to reclaim their land, in 1962 the now-defunct Indian Claims Court ruled the Shoshone had lost control of their land due to settler encroachment. In 1979 the Indian Claims Commission awarded a $26 million land claim settlement to the Western Shoshone. In 1985 the US Supreme Court ruled Shoshone land claims were extinguished by the financial settlement. The Dann sisters, among others, refused the money and asked the US to respect the terms of the 1863 Treaty of Ruby Valley. 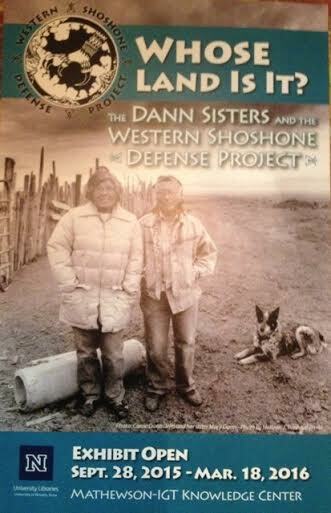 Beginning in 1973, the Dann sisters' were ranching without paying grazing fees to the BLM to run their cattle on what is historically Shoshone land. This led to the BLM, in 1998, issuing trespass notices to the Danns and ordering the removal of hundreds of their cows and horses, from what the BLM considered the public lands of Eureka County. The action against the Danns is documented in Our Land, Our Life. The Dann Sisters' request for urgent action with the United Nations Committee on the Elimination of Racial Discrimination led to the UN ordering the US government to halt all actions against the Western Shoshone people, which the US has largely ignored. In November 2008 Dann, with members of the Western Shoshone Defense Project and four other tribal and public interest groups, sued in federal court against the US Department of Interior and Barrick Gold to stop the "largest open pit cyanide heap leach gold mines in the United States -- the Cortez Hills Expansion Project on Mt. Tenabo," which the Western Shoshone consider sacred land. The Federal Court in Reno ruled in the DOI and Barrick's favor. Mt. Tenabo is being mined and de-watered even as Carrie Dann continues to live in Crescent Valley. Mary passed in 2005. Dann remains renowned, revered and admired as an Elder and positive example of resistance on behalf of the Earth in Native and Environmental and Social Justice circles world-wide. She is an outspoken, honest Native American woman standing up for the Earth and Sacred Sites and speaking for Traditional Native American values.